If you’re like me, you love cheese. Especially mac and cheese. If you’re like my sister, you can’t enjoy this comfort food like you used to. Fear not, dietary-conscious eater. There’s a delicious dish for you to enjoy! Daiya to the rescue! 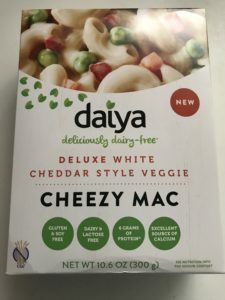 The dairy-free alternative company has three types of cheezy mac: Deluxe Cheddar Style, Deluxe Alfredo Style, and Deluxe White Cheddar Style Veggie. Nikki had the latter. Aside from being dairy-free, it’s also gluten, soy, egg, peanut, tree nut, fish, and shellfish-free. The noodles are made from brown rice and contains no trans fat or cholesterol. 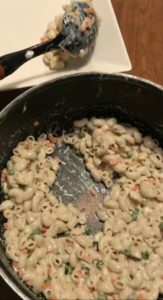 This cheezy mac is 300 calories per serving. As a reminder, I do not recommend looking at the carbs. It’ll make you sad. If you can’t eat dairy or gluten, you should probably try this. This dish is perfect for a quick and easy side. For 1-2 people, this could work as a small meal. That’s it! You’re all done. Told ya it was quick and easy (and cheezy)! Let me know if you try this dish & what you think! Have you tried Daiya’s products before? What’s your favorite? If you’d like other quick and easy meals, check out dietary restriction friendly penne pasta and dietary restriction friendly tacos. Be sure to follow Gluten-Free Spirited on social media and subscribe so you don’t miss anything! Since I began traveling full-time, dieting has been the hardest thing to manage. Can never get enough info about it. That’s the issue that we’ve been running into. Last October when we took a road trip, I realized how hard it was for my sister to find anything. 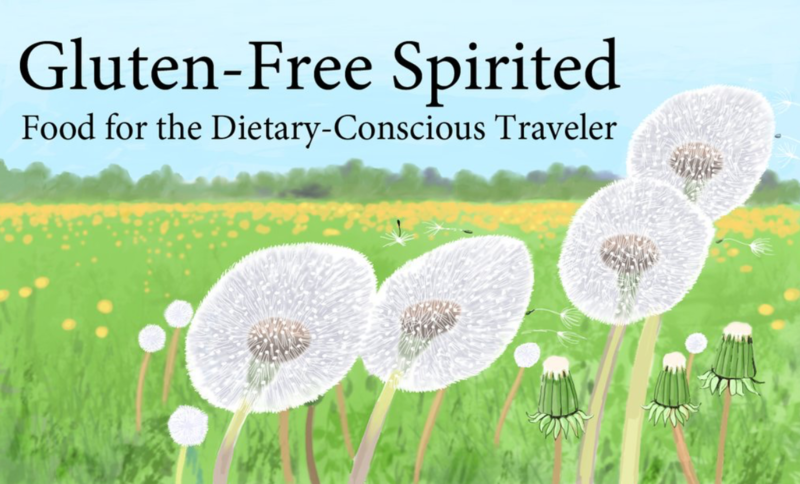 I knew that there were so many facing the same struggles and hope this blog can be a resource for travelers with dietary concerns. Even if you’re traveling & cooking from your hotel/AirBnb, it can still be difficult to find options, so I try to post entries like this to help too. Oh where were such wonders when I was pregnant and had dietary issues?! It looks delish! LOL, options for those with dietary issues have definitely come a long way! My sister loved this dish. Your sister must be so happy, this sounds just right for her and so quick to make. I don’t know how I’d cope not being able to eat Mac&Cheese. It’s a staple on our weekly menu. She is very happy! She’s also a big mac & cheese fan and had been looking for a replacement when we came across this. I’m actually trying to make the transition to vegan and I heard Daiya cheese is great. I feel cheese is going to be the hardest thing for me to give up. I make Alfredo a lot and I really need to find a good replacement for that. My sister is a fan of Daiya & also Follow Your Heart (she prefers the latter). She highly recommends Daiya’s cheesecake. We haven’t been able to find a replacement for Alfredo either. That’s my sister’s favorite dish & she misses being able to eat it. This looks so good! I can’t believe is Dairy-free and overall healthy. It is so hard to find cheesy pasta dishes that fit all of that. I will definitely be giving it a try! My sister is a really big fan of Daiya & was really happy to try find this. She really loves their cheesecake. Let me know if you try them & what you think! How absolutely wonderful something like this is available. Even people on special diets like to have their favorite comfort food. It can be so hard when the choices are limited. Exactly! I wanted to help people find dishes that they might be able to eat. My sister has been through a lot of trial and error to find food that tastes good, so I want to tell people with dietary restrictions what we’ve found that we like & hope they like it too. this sounds fabulous, and avoid lots of the danger food for many people! That’s awesome; so helpful for GF travelers. My GF friends would appreciate this! I need to look for this next time I’m in the grocery store. It looks like the mac and cheese turned out great! It did! Let me know if you end up making it & what you think of it! One of my good friends eats gluten-free and I am always looking for new dishes to prepare when she and her family are over for dinner. I will definitely be saving this recipe! 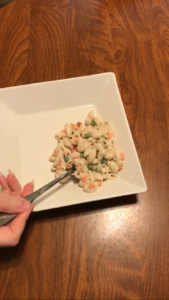 Mac and cheese is one of my favorite dishes! Pasta n cheese is an indulgence for me too! I eat it when I want to reward myself for the hard work I’ve done. I’ve never tried dairy free cheese before, but the meal looks lovely still. I love all kinds of cheese, including vegan cheese! Yum!